It took two years of relentless campaigning and nearly 700,000 concerned people from around the world, but today we are sharing the good news that together we convinced the world’s largest tuna company to clean up its act! 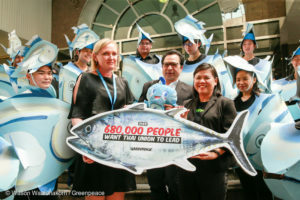 Tuna giant Thai Union, which owns brands such as John West, Chicken of the Sea, Petit Navire, Mareblu, and Sealect, has committed to a series of changes to its business that will help to protect seafood workers, reduce destructive fishing practices, and increase support for more sustainable fishing. This marks a major shift for the corporation and sends a signal to the entire fishing industry to do better for the oceans and seafood industry workers. As the world’s biggest tuna producer, one in five cans of tuna sold globally are canned by Thai Union. 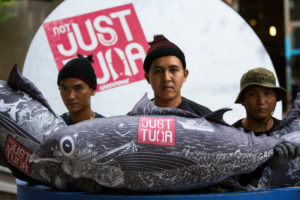 Greenpeace’s global campaign to transform the tuna industry has included targeting its brands for several years through tuna rankings, along with assessments of food service companies, supermarkets, and other brands supplied by the company. Almost two years ago, we launched a global campaign, calling on Thai Union to bring the tuna industry out of the shadows where a cycle of overexploitation, devastation and appalling labour practices flourish in the name of profit. Alongside our allies, unions, concerned members of the public and our supporters, we pushed the company toward a brighter future for our oceans, seafood workers and ocean-dependent communities. From our ships on the high seas, to supermarkets, industry conferences, and company headquarters, thousands of people including massive labour unions and human rights organisations joined our call for Thai Union to source more sustainably and responsibly. Together, we pushed companies supplied by Thai Union to sell better products and commit to policies that help workers and our oceans, including tackling practices like transhipment that fuel illegal activity and human rights abuses. So how has Thai Union changed? Thanks to the mounting pressure, starting immediately, the company will begin making the following changes across its global business. Reduce fish aggregating device (FAD) use by an average of 50%, and a double supply of verifiable FAD-free caught fish globally by 2020. FADs are floating objects that create mini-ecosystems and result in the catch and killing of many marine species, including sharks, turtles, and juvenile tuna. Shift significant portions of longline-caught tuna to best practice pole and line or troll caught tuna by 2020 and implement strong requirements in place to help reduce bycatch. Longline vessels are known for catching and killing non-target species like seabirds, turtles, and sharks. Extend its current moratorium on at-sea transshipment across its entire global supply chain unless strict conditions are met by suppliers. Transhipment at sea enables vessels to continue fishing for months or years at a time and facilitates illegal activity. Ensure independent observers are present on all longline vessels transshipping at sea to inspect and report on potential labour abuse, and ensure human or electronic observer coverage across all tuna longline vessels it sources from. Much of the abuse that plagues fishing vessels takes place out of sight without authorities to report to. Develop a comprehensive code of conduct for all vessels in its supply chains to help ensure workers at sea are being treated humanely and fairly, beginning in January 2018. An audit will be conducted by an independent third party next year to measure progress, and in the meantime, we will all be watching and waiting for positive results. Thai Union cannot and should not be taking this on alone. Not only will the vessels catching the fish need to fully cooperate for these commitments to turn into real action and positive change, but all major buyers and sellers of tuna need to recognise that the status quo is no longer acceptable. Supporting more sustainable and socially responsible fisheries, particularly those that are small-scale, is an essential part of any sound tuna sourcing policy. Customers should not have to choose between bad or better, all tuna should be responsibly-caught to help address the oceans’ overfishing crisis. Thai Union’s commitment is not the end of the story to transform the fishing industry, but the continuation of a growing movement to stop out of control companies from wreaking havoc on ocean ecosystems and people’s lives. We need to continue to hold companies accountable and all do our part to reduce the threats to our oceans. Want to help protect our oceans and push for better tuna fisheries? 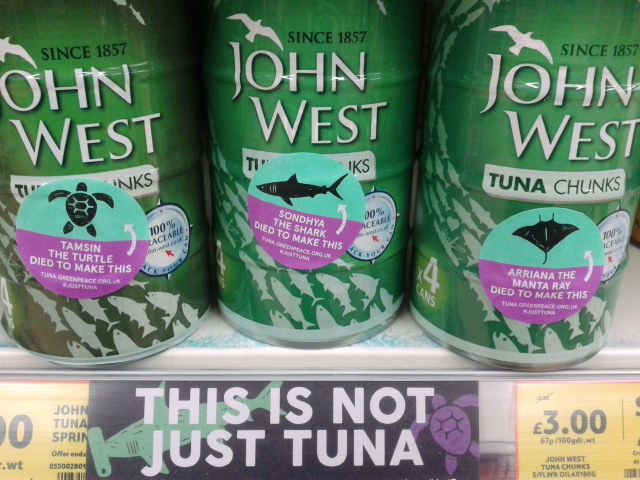 Urge your favourite brand or supermarket to ensure it’s sourcing more responsibly-caught tuna, avoid brands poorly rated in Greenpeace’s tuna rankings, eat less tuna to help struggling populations to recover, and when in doubt, choose vegan “tuna”– yes, that’s a thing! Help us take the fight to the rest of the seafood industry and support all of Greenpeace’s important campaign work at http://www.greenpeace.org/international/en/supportus/.